Spring is just around the corner and the warmer weather has brought a new look to DOMA’s Seahawk facility. After a long wait and a lot of planning the building is finally beginning to really take shape. A bold parking lot sign, large scale window signage, and bright, new graphic wraps are just part of the renovation. We’ve got plenty of changes happening on the inside too. Frosted vinyl has been added to the cubes and conference rooms to create a luxurious feel and new furniture is being added every week. It’s exciting to see these changes coming to fruition after such a long design process. The open layout is game changing in how breaks down barriers, making leadership more accessible and encouraging collaboration between departments. The new tables, glass white boards, state of the art conferencing displays, and the launch of DOMA TV all help to bolster the collaborative spirit DOMA is building. DOMA TV especially has been a welcome addition to the office. Networked TVs throughout the building allow for the quick deployment of corporate initiatives and events. Screens can be divided to simultaneously play local news, display upcoming events, share DOMA’s social media, and announce culture initiatives. This has made it easy to disseminate information quickly and build engagement company wide. Consequentially, DOMA TV is more than just entertainment, it’s a great way to keep people informed without cluttering up their inboxes. We are well on our way to achieving Vision 2021’s goals for our DOMA home. Even with much of the furniture installed there is more still to come. 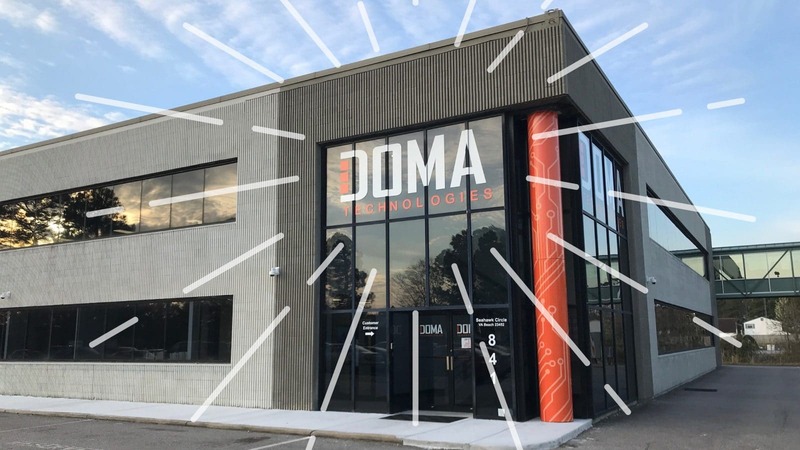 There are some big plans for a few of the underused spaces including a DOMA merchandise store and a software demo station. The marketing department is hard and work designing wall graphics and interchangeable signage as well. The space is continuing to evolve and with each new addition the building is beginning to feel more like home.